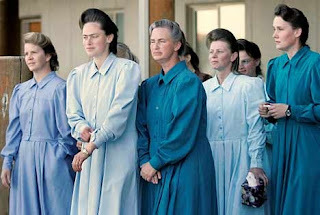 There is a lot of discussion going on at the moment about the alleged polygamous Fundamentalist Church of Jesus Christ of Latter Day Saints group whose compound was raided in Texas. Authorities have reportedly taken into legal custody more than 400 children and 133 women deemed to have been harmed or in imminent danger of harm. According to news accounts, pubescent girls were forced into spiritual marriages to older men. Inside the compound's walls, researchers say, a new reality was born, with members indoctrinated so fully they had no concept of reality outside the walls. They basically believe that women are there to be baby factories, and there is extreme patriarchal control of that group. If you've got a group that's abusing hundreds and hundreds of women and children, let's call it what it is, A CULT. One defined by charismatic leadership and abuse. I get frustrated when I hear people commenting about how they cannot understand how mothers could allow their children to be abused like that. It's not that black and white, just as it is not for anyone involved in violent and abusive relationships. Look at these women's faces - blank. For anyone who doubts how people get into these situations read up some more on cults. May its sociopathic leaders rot in jail. And what a brave young girl who raised the alarm bells, let us hope she is now safe. The sad thing is the torture will continue for these 'victims' for some time to come. It is a tragic thing, what's going on there. Have you noticed that all the woman sound the same? It's almost as if they've arrived from another country and have the same accent. I don't think anyone but them will truly know what's gone on in that world. Those poor young girls that have become mothers so young and have no idea that it's not "normal". I am very interested to see what happens after the DNA testing is completed. How many men will be able to continue to deny that they have slept with girls that are barely teenagers. Lilly, I agree totally - this is a CULT! Anyone who thinks otherwise id off their rocker! It's a shame what they have been doing to those women and children, and authorities have know about this group for many years, since they were in Utah, yet they have done nothing!!!! Makes me sick. Laws need to be changed to allow authorities to search a property like that just on suspicion alone. Good post, keep it up. @ Macnellyfamilyadventures - it is going to be interesting what happens. In some way I hope they keep the information confidential for the children's sake. The reality is there is a lot of counselling going to be have to be done. In terms of them not knowing 'any different', it is interesting that the 16 yr old girl knew that what she was going through was wrong. There comes a point when people are abused that they break, whether they have been brain washed or not. Thank god in some ways she finally broke but I hate to think of their mental shape as a result. Thanks for stopping by. @ Matt - werent they all getting food stamps and government assistance? There has to be something illegal in that too. Guaranteed those at the top have very wealthy bank accounts. Makes me sad, really sad and yet I know it happens all over the world in one way or another. It amazes me how strong the human spirit is to survive stuff like this. Thanks for stopping by. you need to gain more information about them,their beliefs and the source of their beliefs so as to make a sound judgement.I've found that to be safe practice.Its unfortunate if the young children were being forced into early marriage against their will. Nairobian Perspective - yes its unfortunate that anyone is made ot do anything against their will let alone children who are relying on their parents to protect them and keep them safe. Its even more unfortunate when greedy people use religion as a big stick to keep control over vulnerable people. It happening everywhere and I am not sure if its caused because someone is inherently evil or inherently greedy. Thanks for visiting.